Here is GTransition plugin for krpano. Information about GTransition plugin for Panotour can be found on this page. GTransition - is a plugin for krpano, which add transitional effect in the style of Google/Matterport (walk-through transition effect). The plugin will work correctly only in virtual tours in which all panoramas are properly oriented relative to the North (KEEPVIEW'ed virtual tours). It was developed and tested with krpano 1.19 pr16, it is better to use latest krpano version. Also you need to update krpano version if you get 'wrong encryption' krpano error. 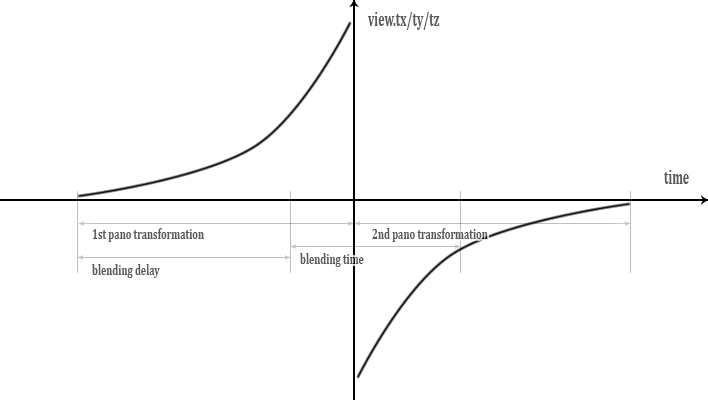 In KEEPVIEW mode, the beginning of one panorama into another stops any transformations of view, so if blending_delay is zero, then the current panorama is replaced by the transforming second, if blending_delay is equal to transition_speed, the current panorama is first transformed and then replaced by a static second. By selecting the duration of blending panoramas and the delay time before it starts, you can achieve different transition effects. Obviously, when using KEEPVIEW|KEEPMOVING, the behavior of the plugin will change. The maximum duration of the transition effect is transition_speed * 2 seconds. By default, the plugin uses a modified skin_hotspotstyle_click - krpano action, called when you click on hotspots. If another procedure is used to load scenes, then in order to add a transition effect to it, by clicking on the hotspot, you must call gtransition_effect (p1, p2) action with two parameters, where the first (p1) is the ath hotspot value and the second (p2) - your scene loading procedure. Ask a question or search for an answer in the official GTransition plugin's group on Facebook. Please PM me with questions about payments and downloads. Fully functional trial version of the GTransition plugin for krpano can be downloaded here.